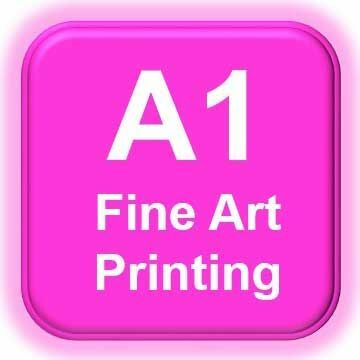 A1 Fine Art Printing. Suitable for Fine Art & Photographic reproduction to Gallery & Museum standard. Ideal for Photography Prints, Artist Prints, Gallery & Art Prints. Printed onto 100% 315gsm cotton based paper. I can't fault these lovely prints. And the service is excellent. I ordered my prints at 13.30pm on Monday afternoon and received them at 10.30 the next morning. This is the second print I have ordered and it won't be the last. My brother has put an order in as well. Now he has seen my print. They look as though they have been silk screened. The best giclee's I have seen. And excellent communication with Chris at Customer support. I would advise anyone to try this service, a good competitive price as well. I hope this review has helped.